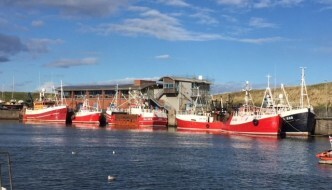 Eyemouth Harbour has founded its commercial operations on servicing the fishing industry. Local businesses can provide the full range of vessel supplies and maintenance tasks and experienced harbour staff are on hand to ensure smooth passage for all users of the port. Commercial vessels of all types use the harbour on a regular basis and we are keen to build this area of the business. Our aim is to be the preferred port for vessels transiting along the east coast and those needing supplies when in the North Sea, and when closer to shore engaged in cable laying, coastal works and marine construction activities. Boat Services: Fresh water and fuel are available in the harbour along with a wide range of local businesses and vessel suppliers. Eyemouth Marine Ltd – specialise in the building, servicing, maintenance, repair and refitting of all manner of commercial craft. Our management team and Board of Trustees are an extremely hands-on group of experienced professionals. We are ready and willing to welcome commercial operations of all sizes to Scotland’s First Port of Call. We also have room for expansion – without spoiling the beauty of the harbour – on land owned by Eyemouth Harbour Trust (EHT) and Scottish Borders Council (SBC) that is accessible via the harbour access road, linking directly to the main A1 trunk road.